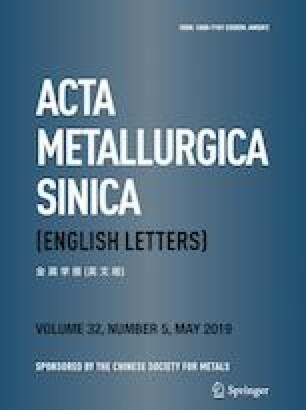 The as-cast microstructure, element segregation and solidification behavior of a multi-alloyed superalloy ЭК151 have been investigated. The results show that the severe element segregation leads to the complicated precipitations at the inter-dendritic region, including η-Ni3(Ti, Nb), eutectic (γ + γ′) and Laves, which shows the characteristics of both Ti, Al-strengthened and Nb-strengthened alloys. Differential thermal analysis, heating and quenching tests reveal the solidification sequence as follows: Liquids → γ matrix → (Nb, Ti)C → η-Ni3(Ti, Nb) → eutectic (γ + γ′) → Laves. The melting points are between 1250 and 1260 °C for (Nb, Ti)C, between 1200 and 1210 °C for η phase, between 1180 and 1190 °C for eutectic (γ + γ′) and Laves. γ′ initially precipitates from matrix at 1150 °C and achieves the maximum precipitation at 1130 °C. According to the microstructure evolution captured during solidification and composition analysis by an energy dispersive spectrometer and electron probe microanalyzer, (Nb, Ti)/Al ratio is put forward to explain the formation of η-Ni3(Ti, Nb) and eutectic (γ + γ′). The solidification of γ matrix increased the Nb, Ti concentration in the residual liquids, so the high (Nb, Ti)/Al ratio would result in the formation of η-Ni3(Ti, Nb); the precipitation of the phase consumed Nb and Ti and decreased the (Nb, Ti)/Al ratio in the liquid, which led to the precipitation of eutectic (γ + γ′). Laves formed by the sides of η-Ni3(Ti, Nb) and in front of the eutectic (γ + γ′) after Al, Ti were further depleted by the two phases and Cr, Co, Mo were rejected to liquids.